THEY DINE WITH BISHOPS. THEY VACATION WITH PRESIDENTS. THEY SLEEP WITH MOVIE STARS. SO WHO CAN STOP THEM WHEN THEIR ACTIONS TURN DEADLY? Sydney Rye and Gia Santella—two fierce vigilantes devoted to justice—meet for the first time when they find themselves caught up in a deadly Silicon Valley subculture revolving around some of the most powerful men in the world. It doesn’t take long for them to realize that the elite group of men are playing a depraved and deadly game and nobody will dare to interfere. It’s left up to the two women to risk it all to stop the men and save more innocent lives. Gia Santella and Sydney Rye soon realize they must learn to trust each other—not only to stop the men—but to survive. 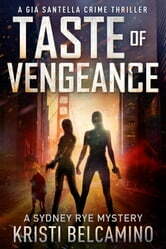 Taste of Vengeance is a fast-paced, compelling, and suspenseful thriller! If you like take-charge heroines, edge-of-your-seat suspense, and gritty drama, you’ll love this action-packed story! BUY "TASTE OF VENGEANCE" TODAY TO BEGIN THE ADVENTURE! I really enjoyed this book, as I've all of Sydney Rye books. I can hardly wait for the next installment of the series be it from you or Emily. I was blown away with this book. Kristi did an amazing job with both worlds and bringing them into one. If you like intense books with two strong females then this book is for you!! Taste of Vengeance yet another fantastic book by Kristi. The female characters in her storylines are so strong but believable. Once you pick up your device everything else goes by the by. They are s superb series but are also fabulous stand alone books. Thanks Kristi.